The first thing she said in her lesson was that this horse had sent her to the emergency room more often than she could count. He bolted with her all the time, she said. He was a lovely, dark gelding with some draft in him; quiet, smart, and big. He looked like an equine Labrador Retriever. That soon changed. She walked away from the mounting block with short reins and tight elbows. Mutual pulling started just a stride at a time, she closed her hands and he felt the restriction. She shortened her reins and he answered with more resistance. He tensed his pol and set his jaw, the tug of war was on. She held fast, he couldn’t breathe so he tried to push his nose out. She got visibly nervous and shortened her reins some more. The miscommunication was easy to see, and he was thinking about panicking, claustrophobic about his bit. Was she inadvertently cuing him to bolt? I asked her to lengthen her reins and she shot me a look of utter disbelief. It was a tug of war she meant to win. So I negotiated, could she slack just her inside rein, just a few strides. She dubiously gave him a fraction of an inch, and the horse gave a small blow, grateful for any relief. It was a start. “Every aid can achieve the exact opposite of its intended effect through exaggeration and poor timing. The continual rein aid lets the horse get stuck and resistant.” Gustav von Dreyhausen. A rein aid is only an aid if it helps. They started out fine, and the resistance grew on both sides one step at a time. Think about it: A massive neck on a big horse vs. tiny bird arms on the human. She is never going to out-pull him and the less oxygen that got to his brain, the harder it was for him to relax. He wasn’t trying to bolt, he just needed to breathe. We are always training either resistance or release, your choice. Maybe you are a western rider and think this doesn’t apply. Maybe you ride on a long rein all the time and then when you need to help your horse, you jerk the slack out of the rein to direct him. He goes from no contact to a full assault in one stride. Is this any less painful for a horse? Commonly at this point, we change to a more severe bit to control him better. It’s like escalating a war, instead of trying peace talks. When a horse resists the bit, honestly evaluate your contact. His vulnerable jaw is in your hands, and the question is more about mutual trust than control. The secret of riding on contact is to move forward, and then release more rein than you take up, follow with your hands. Good contact should feel like a long rein to the horse, more supportive than restrictive. If you lose forward when you pick up contact, your hands are too restrictive. It’s like driving with the parking brake on and the fundamental rule applies: Ride back to front, forward! And now is when I remind you that we don’t ride with our hands, we use our bodies. Pulling on reins is natural to us humans. We are hand fixated. We use our hands to do everything, including thinking! They express our over-controlling natures. Instead, ride with your seat and legs. Have you gotten complacent about bits? Bits are metal on bone. No kidding, no padding, just metal on bone, with your hand on the reins. A bit with shanks is worse. If your horse resists his bit, maybe it is time for you to improve your sensitivity and pass it on. This isn’t a dictatorship, you know. “It is a mistake to keep the horse on the bit for too long. He must be relaxed at the walk on the long rein regularly and afterwards he must be carefully put back together again.” Nuno Oliveira. Maybe it’s humans who have gotten hard in the mouth about bits. Hey, don’t leave us hanging…what happened with the horse and rider? I wish I had known when I started working with horses what I knew when I walked away from it, and even more what I know now. But that’s the way of learning, isn’t it? We could tell by the gleam in my dog’s eye he wasn’t too upset by this poorly trained handler who was after all nice to him except for that darned tight lead! And generally as they were finishing their pass the handler let up a bit and was rewarded with that lovely forward trot. Since I had to hand my dog off because I fell in the ring the first day, I’ll be practicing running more myself, and continuing the great shoe hunt for uneven surfaces. And my dog will be back to being shown by me or people who handle the way I do. You are right, it is the same with dogs. We never get the best work through restriction. Works on people too. I totally agree with this! I realize that there are many disciplines of showing that require the use of the bit, but as I don’t show anymore and strictly ride for the sheer pleasure of it, I have switched to a Dr. Cook’s Bitless Bridle and honestly, I would never go back! 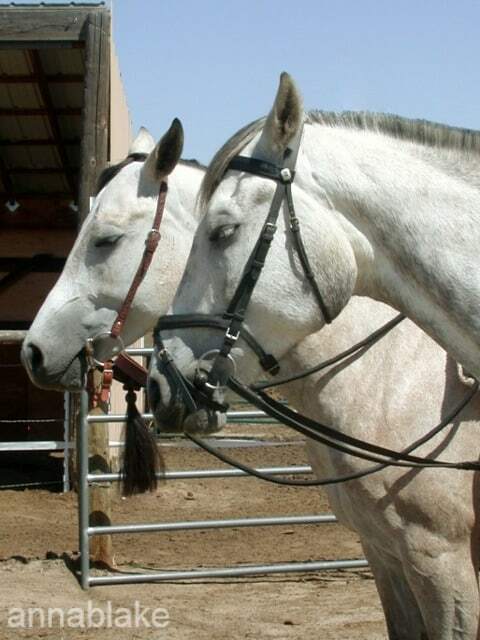 Both of my older (8 year old) geldings, one an OTTB, the other an Appaloosa, both resisted the bit! I did a ton of research online regarding the symptoms they were showing and came across a well known trainer, whose name now escapes me, and he recommended the Dr. Cook’s! I was concerned that I would be losing some of my “control”, but this definitely wasn’t the case! My horses are both well-trained to the word whoa, as well as leg aids (although, the OTTB is still learning), seat shifting etc. that the transition was truly an easy one for me! I just wish that bitless riding would become more acceptable in the show world! I realize that if anyone, my children or grandchildren, should decide they want to show, I will probably have to find a bit that works for my horses, but until then, I will use the Dr. Cooks!